Important information for all avid wine collectors! 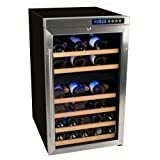 If you delight in pulling out one or more of your wines on regular occasions, our EdgeStar wine cooler reviews will shine a light on a selection of some of the best wine coolers to complement your lifestyle. 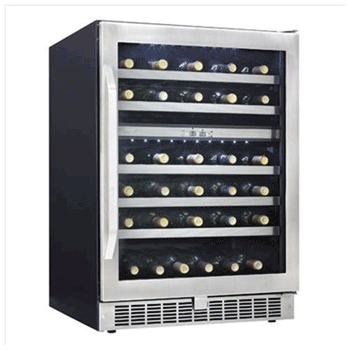 The EdgeStar range of wine coolers depicts a very distinctive appearance. Boasting an unmistakable signature design, EdgeStar cooler designs go beyond aesthetics and cater to practicality too. Whether your intention is to store 30 bottles or over 100, your choice from a range of EdgeStar wine coolers will ensure that you can display your collection while storing it at optimal wine storage temperatures. Maintaining that distinctively elegant EdgeStar “wine lifestyle” look, the EdgeStar 34 Bottle Free Standing Dual Zone Wine Cooler is perfect for keeping different types of wines chilled. This is achieved without the need to use more than one appliance. This wine cooler’s presentation is not to be outdone by its dual zone temperature functionality, though. It combines LED lighting with trimmed wooden racks that slide outward to ensure you can enjoy displaying and admiring your collection as much as you’d enjoy pulling one bottle out for some perfectly chilled indulgence. The two cooling zones simply mean you can store, display and cool both your reds and whites at their respective optimal serving temperatures. The two temperature zones offer independent temperature ranges of 41 to 54F and 54 to 64F respectively. 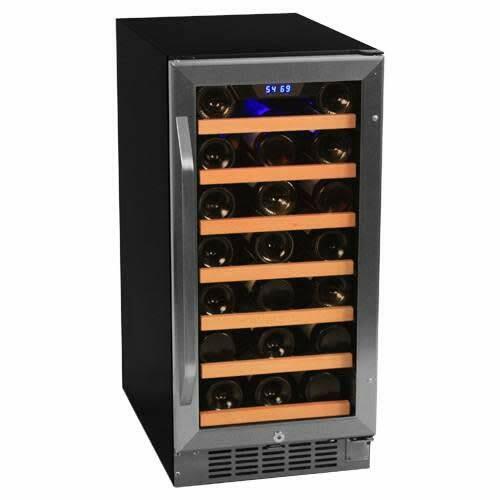 This is a well-built EdgeStar wine cooler with no compromise on presentation and appearance, enhanced by clever use of LED lighting to complement the wood trimming. Unless you’re sitting right next to it, it’s a relatively silent cooler that also maintains temperature precision quite well. 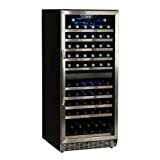 Perhaps a purpose-specific scaled-down version of its 34-bottle Dual Zone Wine Cooler from the same manufacturer, this EdgeStar 30-Bottle Cooler is promoted as a built-in cooler. It shows no signs of being a built-in cooler though if used as a freestanding unit, design-wise. It looks good regardless, featuring a stainless steel trim on the door. It’s perhaps a great cooler for extra storage room, with its 15” breadth making it a perfect fit to replace trash compactors and other outdated appliances. Wines are protected from potentially damaging UV rays by the tinted glass door, while the interior cooling fan evenly distributes cooled air (40- 65F). This cooler is ETL approved, so you can rest-assured of its safety standards. Protects wines from odor contamination with its built-in carbon filter. 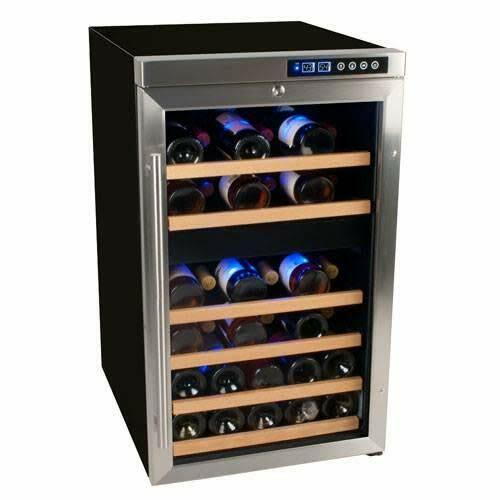 While this 30-bottle, singular temperature zone cooler can definitely be used as a stand-alone unit because of its good-looking all-round appearance, one would imagine the only reason to choose it over something like the 34-door variation from the same manufacturer would be if you genuinely intend to fill the vacant space left by something like your old trash compactor. This cooler’s main pulling factor is indeed its compatibility with its potential built-in surroundings, otherwise, more storage space and functions such as dual temperature zones are available for a little less. Design-wise, you can never go wrong with an elegant French-door profile. This 36 bottle EdgeStar wine fridge takes aesthetics to the next level though. It’s extremely good-looking and wouldn’t be out of place as part of some high-end interior décor items. 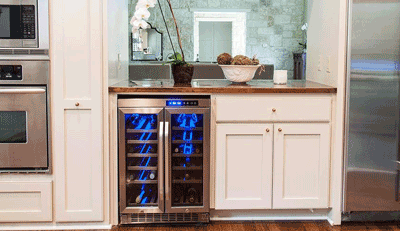 This wine refrigerator’s popularity isn’t solely as a result of its unmistakable good looks, though. It is packed with a lot of great features. Each of its two doors is factory-fitted with a lock, while the 10 wooden shelves (with a stainless steel trim) offer some slide-out functionality. Dual cooling zones are controlled by electronic controls while the carbon filter protects the wines from UV rays. 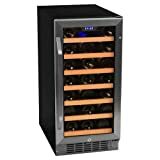 There’s no doubt about the fact that this wine fridge was designed to look good, but it’s a good unit overall that gets the job of chilling up to 36 bottles very well, in fine style too. 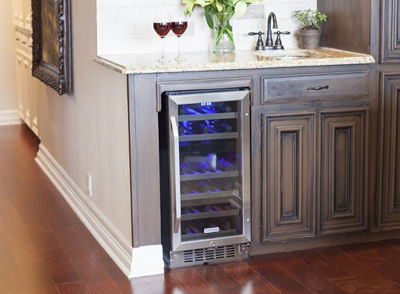 Designed and built for more serious wine collectors who need to chill up to 110 bottles at a time, this built-in cooler is one of EdgeStar’s statement-making wine coolers. At a height of just over 54”, the slightest of both good and bad features would naturally get magnified as a result of the unit’s sheer size. Fortunately, there is more to rave than complain about with this cooler, with its most recognizable feature undoubtedly being its 110 bottle capacity. The Lehman onlooker probably would never have realized how quiet this cooler is, particularly for its size as it is fitted with rubber brush-like bristles to offset vibration and noise. Cabernet Sauvignon wines and other high-end bottles won’t fit between the small shelve spaces which are built more for standard 750ml bottles. That’s a pity since an extensive collection running over 100 bottles would naturally have one or two higher-end bottles that can’t be stored in this cooler. This cooler’s main claim to fame, however, is indeed its 110-bottle capacity, but this feature is enhanced by its dual-temp zone functionality and contemporary design. 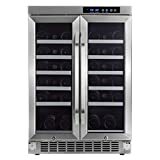 Temperature accuracy is maintained very well and the option of locking the cooler will come in handy for any extensive 100+ wine collection. as we once knew it could very quickly become a thing of the past. EdgeStar appears to be successfully facilitating this transition from traditional wine cellars to wine coolers. This is simply because of their heavy emphasis on making wine coolers look as good as they function. EdgeStar wine coolers take the hassle out of ensuring wine collectors have created the right environment for their wines, particularly those connoisseurs who enjoy indulging in their wines, every so often. Depending on the size of your collection, which in some instances may even be a growing collection, EdgeStar wine coolers give you the option of storing anywhere from 28 to over 300 bottles, AT OPTIMAL TEMPERATURES. If you are indeed a wine connoisseur who doesn’t want to compromise on the display style of their wines but you still want a practical way of storing your prized bottles, there is definitely an EdgeStar wine cooler for you. Purely by way of design, EdgeStar’s coolers are unmistakable in their chic, elegant and modern appearance. 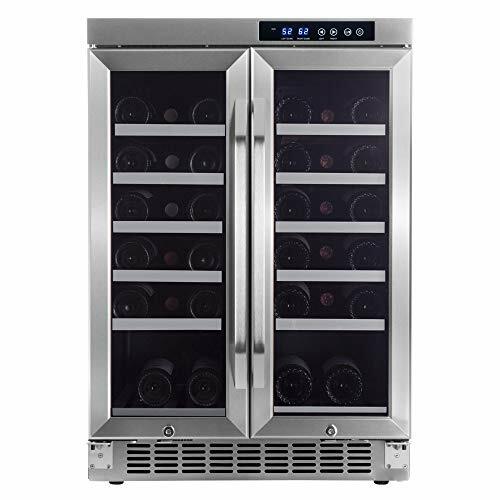 This European-standard elegance is enhanced by the manufacturers’ main aim of maintaining practical functionality in that there is a purpose-built EdgeStar wine cooler for just about every wine storage, cooling, and displaying requirement. Whether you want to build your wine cooler into existing interior cabinetry or indeed if you want a free-standing, portable cooler, there are probably several EdgeStar units which will do well in both settings. At the heart of every wine collector’s list of requirements is the ability to store their wines safely (minimizing the risk of them getting spoiled). You also want to have convenient access to them whenever the urge to indulge takes over. Wines that need to be chilled before consumption can otherwise take ages to reach optimal temperature, by which time the moment has passed. It is with this consideration in mind that EdgeStar makes for one of the best brands to consider because of one’s choice in wine coolers; that and their ultra modern, elegant design. If you’re purely going for styling that will shine on its own or integrated into other interior design themes, EdgeStar is definitely a leader. The EdgeStar name doesn’t just carry elegant style with it though. Your choice of a suitable EdgeStar wine cooler ultimately has the inherent ability to cover all your wine storage specifications. Whether you wish to store some collector’s items and safely display them for quite a bit of time to come, or indeed if you seek regular access to your wines, optimal wine temperatures can be adhered to with impressive accuracy. In many intended instances, dual-temperature zones allow for the storage of red and white wines at optimal SERVING temperatures. Naturally, if you choose to go for bigger EdgeStar units which can store and display over 300 bottles, you’d be aiming for wine coolers that are durable and can pretty much run forever. Nothing lasts forever, though, but EdgeStar wine coolers are built with a number of cleverly-assembled composite parts which can be replaced at a very low cost. Periodic replacement of worn-out parts acts as the equivalent of maintaining a traditional underground wine cellar. The only difference is that now you can pretty much store and display your collection just about anywhere in the house. EdgeStar is arguably leading the way in shaping modern design and functionality standards through their range of wine coolers. 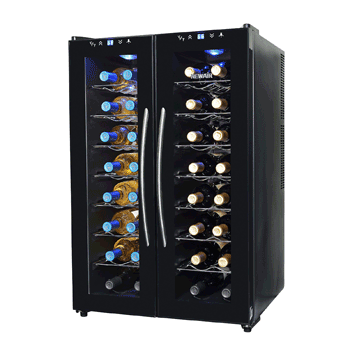 A common denominator among EdgeStar’s wine coolers is an extensive choice in the functionality each unit has available. Subtle differences in the features each unit has accounted for all wine collectors’ tastes in style and functionality requirements. 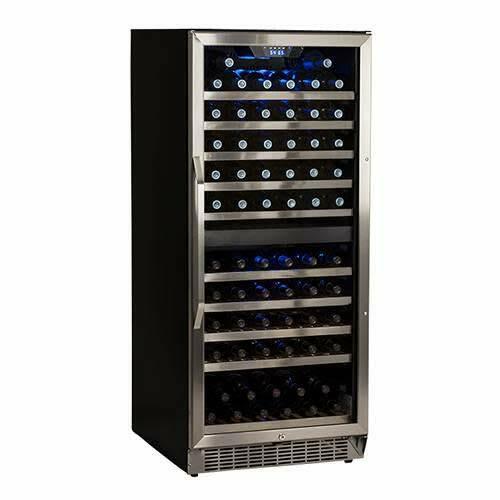 If you are considering the purchase of a modern-looking, elegant wine cooler, our EdgeStar wine cooler reviews will undoubtedly have served to highlight a few key factors for your consideration, particularly with regards to the practicality and versatility of your wine collector’s lifestyle.